Hallux limitus is a decrease in sagittal plane dorsiflexion of the hallux at the first metatarsophalangeal joint (MPJ). Hallux rigidus is a term that clinicians often use interchangeably with hallux limitus but hallux rigidus describes the absence of motion or severely restricted motion of the first MPJ. The normal range of dorsiflexion of the first MPJ should be 65 to 75 degrees to allow for normal propulsion during gait. A limitation of motion at the first MPJ has a variety of potential causes including an elevated first metatarsal, a hypermobile first ray, a long first metatarsal, a square first metatarsal head or trauma. Regnauld and Drago classified hallux limitus into four stages.1,2 Stage 1 is a functional limitation of motion at the first MPJ when the foot is in a weightbearing or loaded position. There is mild pain but no degenerative joint changes on X-ray. Stage 2 is a mild limitation of motion at the first MPJ with radiographic changes. There is a mild flattening of the metatarsal head and small dorsal exostosis visible on X-ray. In stage 3, patients have a moderate limitation of motion with non-uniform joint space narrowing, dorsal osteophytes, subchondral cysts and sclerosis of the joint on radiographs. In stage 4, patients have an absence of motion to minimal motion at the first MPJ with obliteration of the joint space on X-ray. Conservative treatment of hallux limitus involves oral anti-inflammatories, physical therapy or steroid injections. An orthotic may be beneficial in plantarflexing the first metatarsal to increase range of motion or restricting the motion in the first MPJ with a Morton’s extension to reduce pain. Stiff soled shoes or rocker bottom shoes will often be beneficial in patients with hallux limitus to assist with propulsion. For severe arthritis or late-stage hallux limitus, we recommend a joint destructive procedure such as an implant or arthrodesis. For mild cases of hallux limitus, a cheilectomy and/or joint decompression is often indicated. A common complication or development after a joint decompression or cheilectomy is stiffness or adhesions to the first MPJ. Often, patients will need physical therapy to reduce scar tissue and adhesions in the joint. Occasionally, patients may need to return to the operating room for manipulation of the first MPJ under anesthesia to get increased motion in the joint. Human amniotic membrane is a new material that can reduce adhesions and scarring in the joint, allowing patients to have better range of motion in the joint sooner. Human amniotic membrane is the innermost lining of the placenta and consists of three layers: a single layer of epithelial cells, a thick basement membrane and an avascular stroma. In one study by Kim and colleagues, researchers wrapped a human amniotic membrane around perineural adhesions in rabbits with ulnar nerve neuropathy.4 Using 10 rabbits, the authors exposed, dissected and repaired the bilateral ulnar nerves of each rabbit. Researchers wrapped amniotic membrane around the repair site in one limb and did not apply the amniotic membrane wrapping in the contralateral limb. Three months after the original surgery, researchers found significantly fewer perineural adhesions and fibrosis around nerves wrapped with the human amniotic membrane in comparison to controls. Ozgenel and Filiz evaluated 72 rats with epineurectomies of right sciatic nerves.5 The rats received treatment with either placebo or a human amniotic membrane wrap of the nerve alone or a combination of a human amniotic membrane wrap with a hyaluronic acid injection. Researchers performed macroscopic and histologic evaluation to assess for adhesions and perineural scar thickness at four and 12 weeks. The authors found the nerves treated with a combination of hyaluronic acid and human amniotic membrane wrap developed the least amount of adhesions and scar tissue. Tao and Fan studied the effects of amniotic membranes on reducing epidural scar adhesions after laminectomies in a canine model.6 Gross pathologic observation of the animals detected that cross-linked amniotic membrane was effective in reducing epidural fibrosis and scar adhesions after laminectomies. Petter-Puchner and colleagues randomized 24 rats into a study to evaluate the effect of human vital amniotic membrane on reducing adhesions for intraperitoneal onlay meshes.7 All meshes in the control group developed severe adhesions. Treatment groups with the amniotic membranes had reduced adhesions and no foreign body reactions or unfavorable immunologic responses. Demirel and co-workers evaluated the effect of amniotic membrane in preventing adhesions after strabismus surgery in 20 eyes of 10 pigmented rabbits.8 They performed the same procedure on both eyes of each rabbit but used an amniotic membrane on the right eye and used the left eye as a control. They found no adhesions in the amniotic membrane group and various degrees of adhesions in the control group. Fibrosis was present in 40 percent of specimens in the amniotic membrane group and 90 percent of eyes in the control group.8 The level of fibrosis in the control group was higher than in the amniotic membrane group. There were more inflammatory cells in the amniotic membrane group, which the authors attributed to a possible xenograft reaction to human tissues. They concluded that the amniotic membrane was effective in preventing adhesion formation. We have recently been applying human amniotic membrane to the dorsal aspect of the first metatarsal head after a cheilectomy to help reduce inflammation and adhesions associated with the surgery. 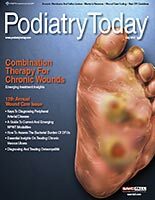 We have found anecdotally that patients who receive the membrane on the dorsal first metatarsal head after cheilectomy generally have less pain and swelling, and a better range of first MPJ motion after surgery in comparison to control patients. Several studies have demonstrated that human amniotic membrane decreases adhesions and reduces inflammation, and that the membrane has antimicrobial properties as well. The membrane can decrease scarring and adhesions after surgical procedures in the spine, eye and around nerves in various animal models. We have tried the amniotic membrane in cases of hallux limitus and have seen improvement in range of motion and decreased adhesions in the first MPJ in our initial clinical experience. Further studies should evaluate the role of human amniotic membrane in foot and ankle surgery in both human and animal models as it may have a variety of uses in reducing adhesions after tendon repairs, joint spur resections, joint arthroplasties and nerve decompressions. Dr. Yau is a Fellow at the University Foot and Ankle Institute in Los Angeles. 1. Drago JJ, Oloff L, Jacobs AM. A comprehensive review of hallux limitus. J Foot Surg. 1984; 23(3):213. 2. Regnauld B. Hallux rigidus. In The Foot, Springer-Verlag, Berlin, 1986, pp 345–359. 3. Sippel KC, Ma JJ, Foster CS. Amniotic membrane surgery. Curr Opin Ophthalmol. 2001; 12(4):269-281. 4. Kim SS, Sohn SK, Lee KY, et al. Use of human amniotic membrane wrap in reducing perineural adhesions in a rabbit model of ulcar nerve neurorrhaphy. J Hand Surg (European Volume). 2010; 35(3):214-219. 5. Demirel S, Atilla H, Okcu Heper A, Erkam N. Effects of amniotic membrane on wound healing and ahesions in experimental strabismus surgery. Eur J Ophthalmol. 2009; 19(6):899-904. 6. Tao H, Fan H. Implantation of amniotic membrane to reduce postlaminectomy epidural adhesions. European Spine J. 2009; 18(8):1202-1212. 7. Petter-Puchner AH, Fortelny RH, Mika K, et al. Human vital amniotic membrane reduces adhesions in experimental intraperiotneal onlay mesh repair. Surg Endosc. 2011; 25(7):2125-31. 8. Ozgenel GY, Filiz G. Combined application of human amniotic membrane wrapping and hyaluronic acid injection in epineurectomized rat sciatic nerve. J Reconstructive Microsurgery. 2004; 20(2):153-157.